I have been terribly remiss in posting about this; I got an e-mail about it just as I was making my way to Princeton last month, and I was quickly occupied with other things even once I was back. 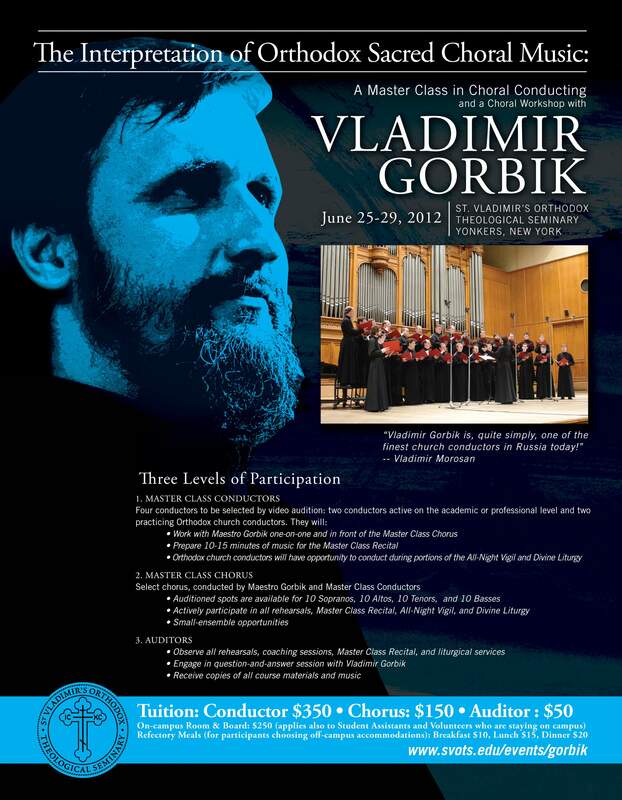 Dr. Vladimir Gorbik, director of choral music at the Podvorye (“representation church”, the parish dependency of a monastery) of the Trinity-Sergius Lavra in Moscow, will be giving a masterclass and workshop at St. Vladimir’s 25-29 June. One must audition to be able to participate, and there are three ways to take part — as a conductor, as a singer, and as an auditor. There are four slots for conductors and 40 (10 for each voice type) for singers. Registration fees are $350 for the course and $250 for room and board on the seminary campus, which I have to say, is a fantastic deal for this kind of thing. Registration links and more information can be found here. I’d love to go myself, but there are a couple of things that I will be occupied with right around that timeframe, one I’ve announced and one I haven’t yet. Nonetheless, this looks like it’ll be a great opportunity for any and all choral musicians with an interest in Russian Orthodox repertoire. The Case Against Diodore and Theodore: Texts and Their Contexts, edited with a translation and a historical and theological introduction by John Behr. This is a landmark work, providing the first complete collection of the remaining excerpts from the writings of Diodore of Tarsus and Theodore of Mopsuestia together with a ground-breaking study of the controversy regarding the person of Christ that raged from the fourth to the sixth century, and which still divides the Christian Church. Destroyed after their condemnation, all that remains of the dogmatic writings of Diodore and Theodore are the passages quoted by their supporters and opponents. John Behr brings together all these excerpts, from the time of Theodore’s death until his condemnation at the Second Council of Constantinople (553) – including newly-edited Syriac texts (from florilegium in Cod. Add. 12156, and the fragmentary remains of Theodore’s On the Incarnation in Cod. Add. 14669) and many translated for the first time – and examines their interrelationship, to determine who was borrowing from whom, locating the source of the polemic with Cyril of Alexandria. On the basis of this textual work, Behr presents a historical and theological analysis that completely revises the picture of these ‘Antiochenes’ and the controversy regarding them. Twentieth-century scholarship often found these two ‘Antiochenes’ sympathetic characters for their aversion to allegory and their concern for the ‘historical Jesus’, and regarded their condemnation as an unfortunate incident motivated by desire for retaliation amidst ‘Neo-Chalcedonian’ advances in Christology. This study shows how, grounded in the ecclesial and theological strife that had already beset Antioch for over a century, Diodore and Theodore, in opposition to Julian the Apostate and Apollinarius, were led to separate the New Testament from the Old and ‘the man’ from the Word of God, resulting in a very limited understanding of Incarnation and circumscribing the importance of the Passion. The result is a comprehensive and cogent account of the controversy, both Christological and exegetical together, of the early fifth century, the way it stemmed from earlier tensions and continued through the Councils of Ephesus, Chalcedon, and Constantinople II. Fr John Behr is the Dean of St Vladimir’s Seminary and Professor of Patristics, teaching courses in patristics, dogmatics and scriptural exegesis at the seminary, and also at Fordham University, where he is the Distinguished Lecturer in Patristics. His early work was on issues of asceticism and anthropology, focusing on St Irenaeus of Lyons and Clement of Alexandria. After spending almost a decade in the second century, Fr John began the publication of a series on the Formation of Christian Theology, and has now reached the fifth and sixth centuries. He has recently completed an edition and translation of, and introduction to, the remaining texts of Diodore of Tarsus and Theodore of Mopsuestia. He has also published a synthetic presentation of the theology of the early centuries, focused on the mystery of Christ. If, perhaps, you’re looking for something a little less spendy, the book on Ss. Irenaeus and Clement would also work. There’s also the amusing anecdote in which I see somebody whom I think might be an usher at a Broadway musical who actually turns out to be Fr. John Behr (to whom I’m still quite grateful for his encouragement, I might add, even if I didn’t wind up going to St. Vlad’s and even if I decided to not go with his more specific research-related questions… yet). A brief post for the moment (with a longer post coming) — anybody out there planning on going to the St. Vladimir’s Annual Summer Symposium next week? I am strongly considering going, last minute though it may be, and am curious who else might be there. Let me know. Just a note: pictures which are much better than what I was able to get of the Conference may be found here. The problem I consistently had was taking pictures while trying to not make a nuisance of myself, which usually meant trying to take them from a fair distance off using the zoom, but which also made the pictures fairly susceptible to the slightest shake of my hand. Anyway, most of these pictures were, I believe, taken by Sofia Lopoukhine, the St. Vlad’s staffer who really made the whole thing happen (at least from a participant’s perspective). I encourage you to take a look. The highly anticipated release of Cappella Romana’s groundbreaking recording of the complete Divine Liturgy in English, set to traditional Byzantine chant, will be released on July 14 at the Clergy-Laity Congress of the Greek Orthodox Church of America in Washington, DC. The CD will first be available at the congress, and orders may be placed online beginning July 14. Shipments will begin July 19. Employing the official English translation of the Greek Orthodox Archdiocese of Thyateira and Great Britain, this 2-disc set presents the complete service (ακολουθία) of the Divine Liturgy of St John Chrysostom. Litanies and prayers pertaining to the entire Eucharistic assembly are rendered in full. The hymns and responses represent the central traditions of Byzantine chanting, including works adapted from Petros Peloponnesios, Nileus Kamarados, and St. John Koukouzelis. A collection of musical scores for the chants on this recording will be available in Byzantine and Western (staff) notation through our website. This recording was made possible by major grants from the Virginia H. Farah Foundation, the A.G. Leventis Foundation, the Fellowship of St. Alban and St. Sergius, and the National Forum of Greek Orthodox Church Musicians. I realize that there are two of you pumping your fists right now cheering “Right ON!” and the remaining three of you who are wondering what the heck this is and why it’s important. That’s okay. Basically, this recording, has the potential to set the standard for what Byzantine chant should sound like in English. Right now there’s kind of a range of poor to really good — the best example in English of which I can think right now being the Mt. Lebanon Choir’s recording (but which doesn’t quite set the standard, at least for me, because it’s clear it’s being sung by non-native English speakers), and I’d really rather not go into which ones I don’t exactly find optimal, at least not in a public forum. Let’s put it this way — it’s clear to me that the English recordings of the St. Vladimir’s Seminary Chapel Choir over the years have had a huge impact on what people expect to hear. I’m very hopeful that this recording, intentionally a thorough effort to match a good English translation to the traditional settings, sung by a professional choir which counts several faithful Orthodox Christians among its membership and staff (including its artistic and executive directors), can have a similar impact. If the entire recording is as good as excerpts to which I was treated a couple of years ago, it should also settle once and for all the silly question of whether or not Byzantine chant can sound good in English or if it will always sound like “camel-whipping music” (a particular friend’s term). For my own part, I will say that I believe this recording was announced four years ago, and was completed two years ago or so, and I’ve definitely been one of the people “highly anticipating” its release that whole time. (I think I’ve been posting annoying “When does it come out?” comments on the CR blog for roughly the last year.) I’ll also briefly mention that the friendship of the executive director, Mark Powell, along with his wife Kathleen, to say nothing of the willingness to talk about his faith and to answer questions, was one of the major instruments by means of which Megan and I were initially exposed to Orthodox Christianity, and it’s been an example we’ve tried to follow since — but that’s a story for another time. 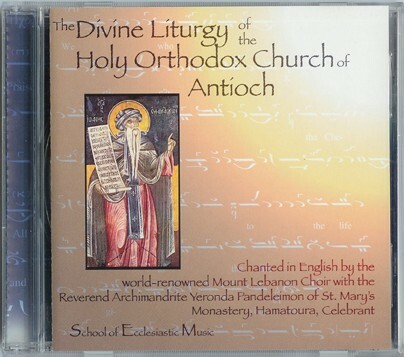 I will also note that Cappella Romana also has a sale going on where the Lycourgos Angelopoulos recording of the Divine Liturgy is available for roughly 20% off. This is one of the recordings which really captivated me early on, and I can’t recommend it highly enough. It was very difficult to find in this country five years ago, and could very well be so again with the way non-pop recordings come in and out of print, so I encourage you to get it while you can!